Chair Hoods & Wraps are THE in thing!! Our wedding chair hoods are available in organza, Lace and chiffon! 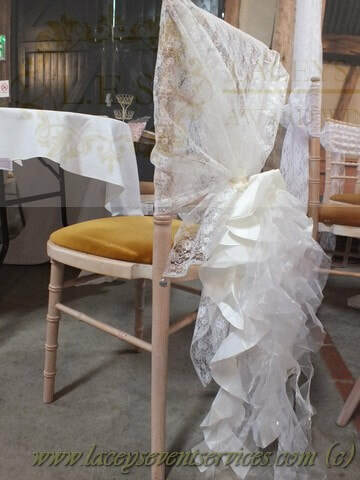 Our Ruffles are available in White, Champagne Peach and Vintage Pink chiffon or Ivory organza/Taffeta mix . 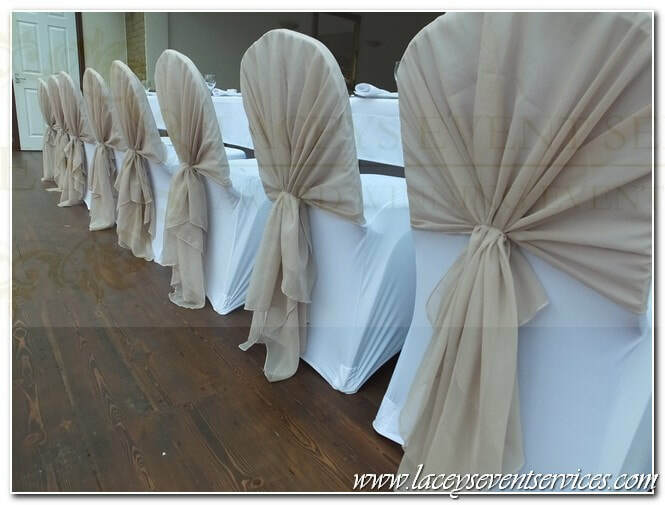 Wedding chair hoods & Ruffles are sure to WOW your guests! 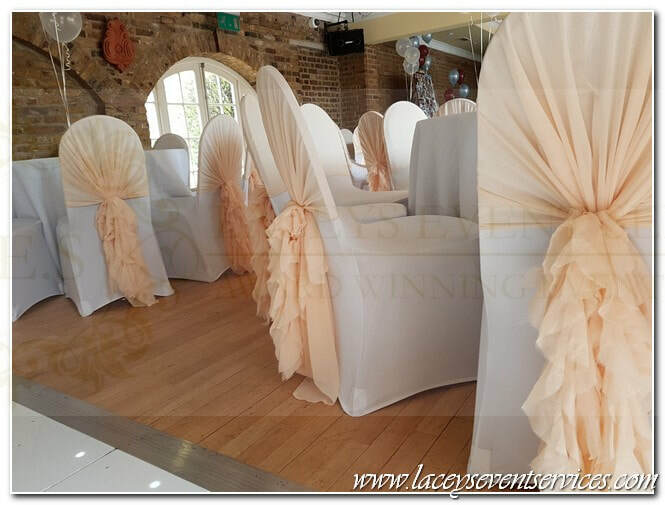 Standing out as something different from the traditional wedding chair cover and sash you can use block colours to make a statement or delicate lace and waterfall ruffle hoods to soften to the look of your venue! 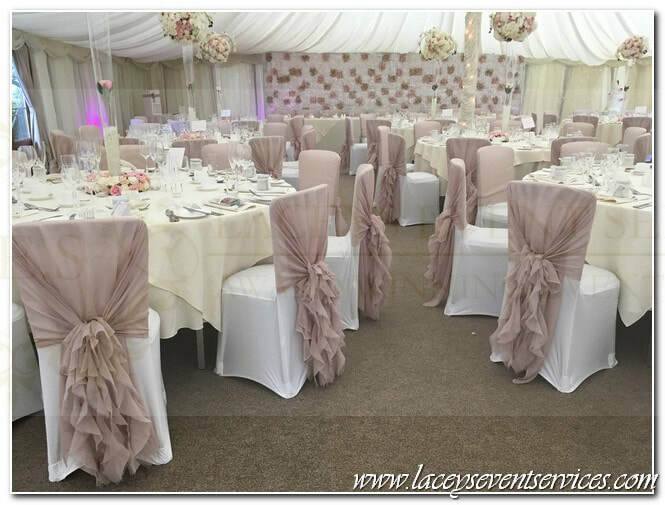 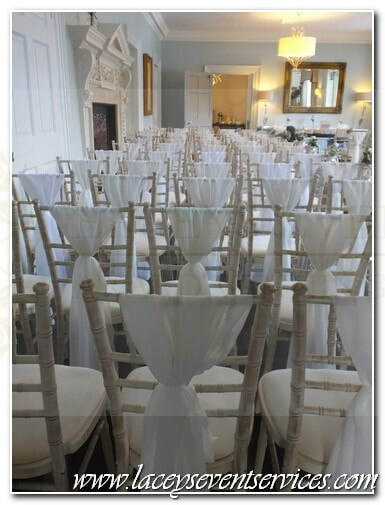 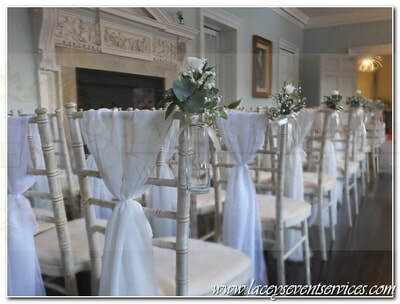 A great choice for use with Chiavari and Cheltenham banquet chairs with or without chair covers! 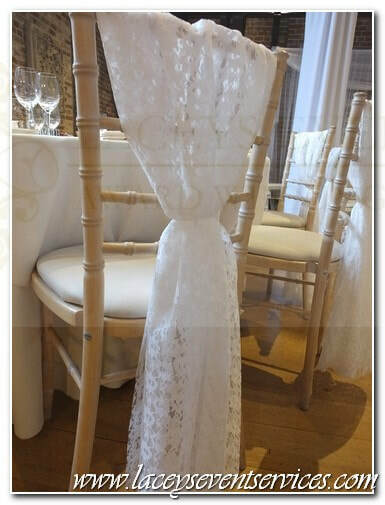 Our Vintage Lace Hoods are a popular hire option alone for Chivari Chairs, or alongside chair covers on standard banquet chairs. 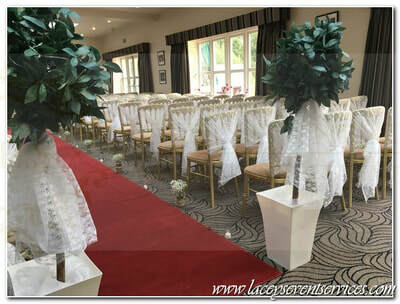 Our Lace Chair Hoods are available in Black Lace Hoods, White Lace Hoods, Ivory Lace Hoods, Pink Lace Hoods and Red Lace Hoods. 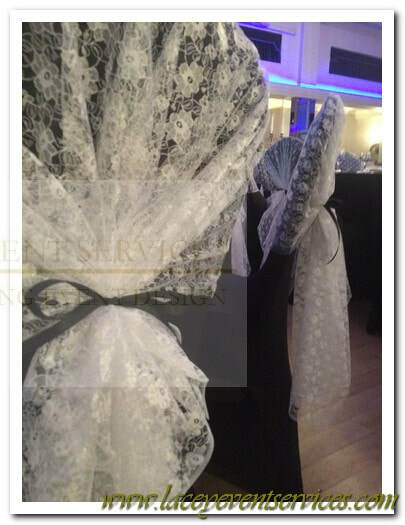 We can also combine a white lace hood and coloured organza sash if you are looking for a different colour. 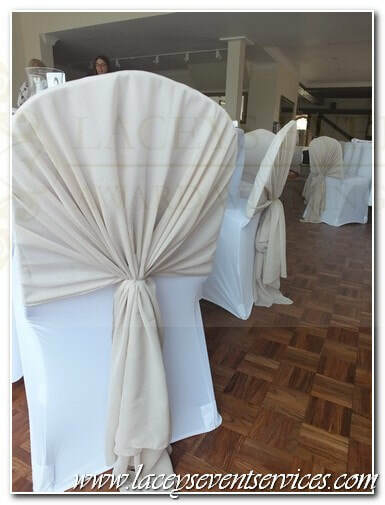 Our chiffon hoods are very popular to dress wedding chairs without chair covers and are available in a range of colours. The most popular being Vintage Dusky Pink, White, Ivory, Peach and Champagne. Our chivari wraps or vertical drops as they are sometimes referred too are available in both chiffon and Lace! 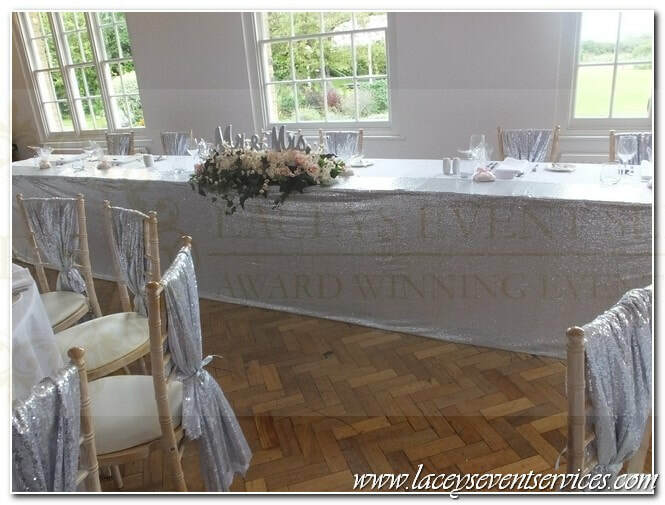 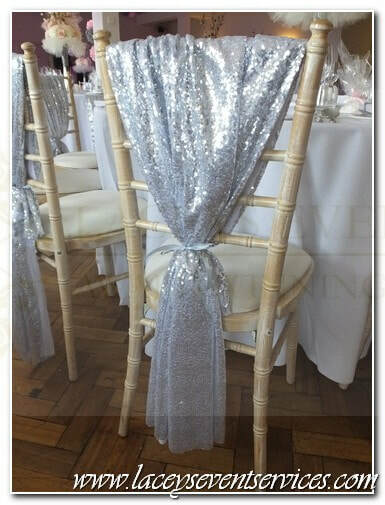 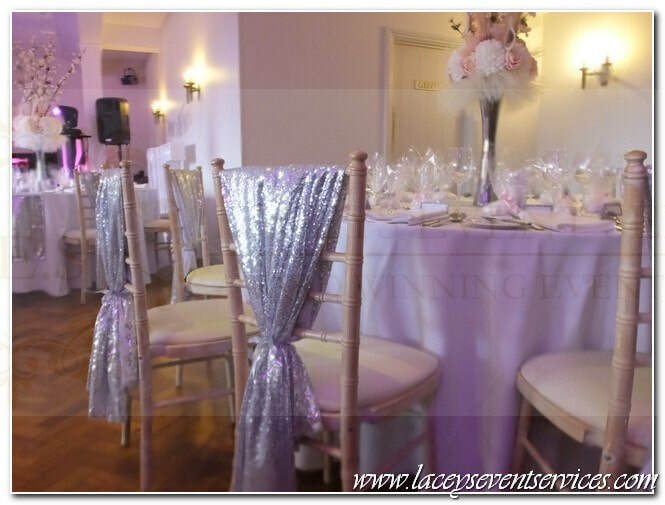 Our sequin Chivari chair vertical drops are available in both Gold Sequin and Silver sequin and look fab teamed with our sequin table swags and sequin table runners and sequin backdrops! 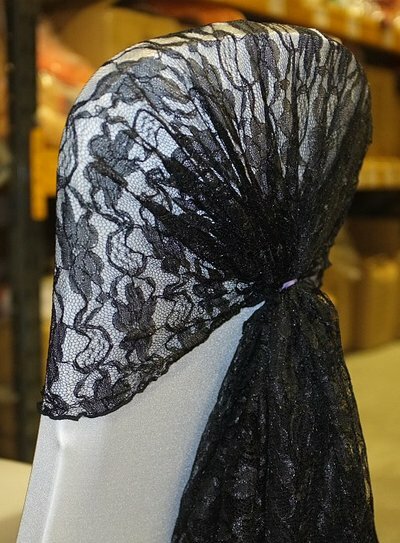 Waterfall Ruffle Tails are a great addition to Chiffon and lace hoods and more recently are even being added to standard sashes. 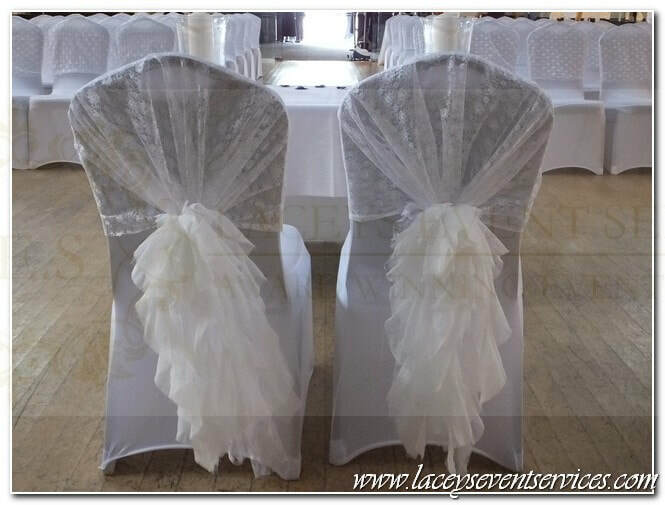 They are made up of layers of chiffon, taffeta and organza and tie neatly onto the back of your hood or sash to create a ruffled waterfall effect on your wedding chair! Alternative to Wedding Chair Covers : ruffle chair hoods, ruffle chair covers, ruffle wedding sashes, lace hoods, lace wedding, Waterfall chair sash, ruffle chair sashes, Wedding Organza Hoods & Organza Wrap Hire, Wedding Chair decorations, Lace chair decorations, Chivari Chair Drops, Vertical Chair Drops, Chiffon Chair Drops, Chiffon Chair Drapes: in shoeburyness, southend, southend on sea, rochford, leigh on sea, westcliff, Hockley, Chalkwell, Rayleigh, Benfleet, Thundersley, Canvey Island, Wickford, Basildon, Pitsea, Thurrock, Stock, Billericay, Brentwood, Warley, Langdon, Hornchurch, Bulphan, Dartford, Rochester, Rainham, Dagenham, Southminster, Burnham on crouch, South Woodham ferrers, Rettendon, Witham, Maldon, Braintree, Stanstead, Ongar, Quendon, Cold Norton, Stanstead, great dunmow, Halstead, Colchester, Mountfitchet, Harlow, Bishops stortford, Great Notley, South Ockendon, Gravesend, North Weald, Sawbridgesworth, Lexton, Mersey Island, Ingatestone, Rawreth, nounsley, Wickham Bishops, Goldhanger, Great Totham, Tolleshunt Darcy, Bicknacre, Danbury, Little Baddow, East Hanningfield, East Horndon, Chelmsford, Romford, Barkingside, Ilford and Harlow.